Rural France—a land filled with picturesque villages, fairytale castles, medieval towers, ancient churches, fresh food markets and Michelin-starred restaurants—all connected by a network of well-maintained walking paths. If you’re anything like me, the thought of driving through Paris fills you with angst— navigating through the maze of narrow one-way streets, the crazy traffic around the Arc de Triomphe (where cars entering the roundabout have right-of-way???) or the complete bedlam through Place de la Concorde. I get nervous just thinking about it! If you’d rather experience France at a slower pace, exploring the villages that have captured your imagination, then perhaps a walk along one of France’s hundreds of walking paths will be more to your liking. Walking is almost a national pastime in France and tens of thousands of kilometres of paths criss-cross the country. Following in the footsteps of early pilgrims along the Chemin de Saint-Jacques? Enjoying the peace and tranquillity of the Midi Canal? Exploring the châteaux and ‘most beautiful villages’ on the walk from Martel to Rocamadour or along the Burgundy Canal? Once you’ve chosen an area, a good guidebook will help you to plan out an itinerary that you feel comfortable walking each day and that allows you plenty of time to explore those fairytale castles, climb medieval towers, fossick through local markets and enjoy the best of fine French cuisine. I Love Walking in France guidebooks come in PDF format which allows easy access to website links or can be printed if you prefer to carry a paper copy. This book covers a 163km section of the GR65, The Way of Saint James, a world famous1500km pilgrimage route to Santiago de Compostella in Spain. Melinda writes a cheerful and amusing story as she enjoys the numerous villages en route with their historical and gastronomic delights. The text is enhanced with many outstanding photographs taken by the author and her daughter. For me, the holiday planning is an important part of the holiday and generally starts in the early winter of the year before the holiday. Now I realise that this approach doesn’t suit everyone and that there are plenty of people who would happily do away with most of the planning and just get on and enjoy the holiday. If you are one of these people, this is the book for you. No messing around on the internet looking for train timetables, accommodation, routes, things to do or see, places to eat or places to drink; it has all been done for you, all you have to do is read the book and then get on and make your bookings, it even has a section of useful French phrases and sayings to help you with the booking process. I have to say that as I get older it becomes more and more tempting to follow this course. Melinda Lusmore has gone to the trouble of taking a holiday on your behalf to make your holiday easy and successful; she has walked the walk and found all the useful things along the way to make your holiday more enjoyable, even to the extent of listing local taxi companies in case you get footsore. That’s what I call attention to detail. 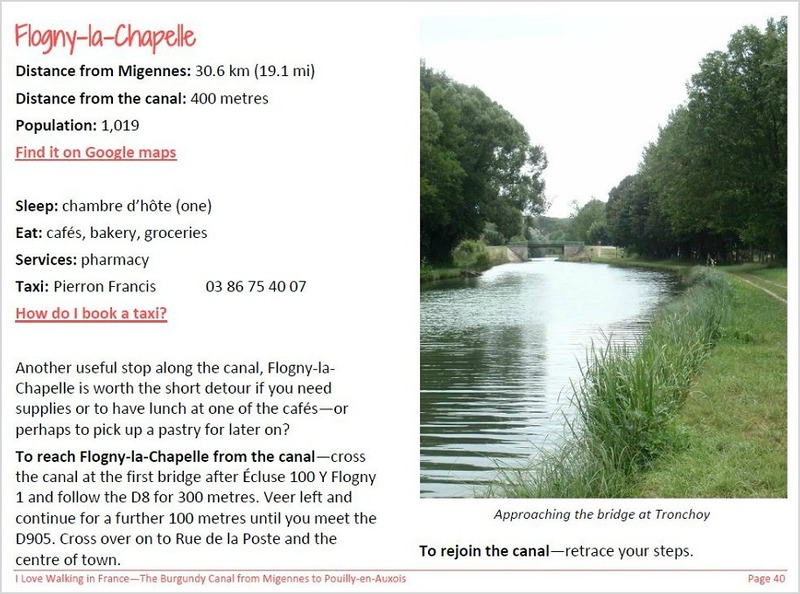 Seriously though, if a walking holiday along a French canal appeals to you, and it does to me, this is the book to have downloaded on you smartphone. I know I would. “As an experienced walker in both England and France, I gave up hill walking a while back in favor of walks along waterways. They have the advantages of less strenuous walking, the near impossibility of getting lost, and the beauty of being in sight of water every day. My last walk in France was along the Burgundy Canal, between Pouilly-en-Auxois and Dijon. I enjoyed it so much I wanted to walk more of the canal and that’s when I discovered Melinda’s website and her guide for the route I was about to plan for myself. I know how many planning elements must come together for a successful long-distance walk and after reading Melinda’s guide, it’s clear she knows, too. It will benefit both novice and experienced walkers, is well-organized with all the bases covered and beautifully illustrated for inspiration. “We have lived in France, visited regularly over 35 years and done a lot of independent walking along roads and trails generally using local maps. What has been lacking is a publication in English that combined sensible general advice on walking in France with detailed instructions on routes and facilities on interesting off-road trails. I think Melinda Lusmore has achieved this in her website and publications. She has compiled a series of practicable and beautiful walks combined with geographical instructions and a wealth of good advice. She has been very helpful too in our direct email contact. Melinda is my #1 source for walking tours in France. Before I found her, I didn’t know what GR paths were. We’re a family of New Yorkers, and love a good long walk. These walking paths are now, on our must-do list in France, thanks to Melinda. Although, we may cycle parts of this walk, it’s great to know, especially traveling with our 11 year old daughter, what exactly to expect. Melinda details everything one may need to start this amazing walking tour of the Burgundy Canals: Distances, Village population and history, rest stops, luggage drop off and pick up, hotels, gites, restaurants and much more. I very much appreciate all the distances listed between the villages. It helps me time my walk/cycle and make sure my daughter is hydrated and fed. Melinda thoroughly details what to expect and how to match every family members’ expectations. I also appreciate the history she teaches us about the region so I can make the walk into a fun education for all three of us. I Love Walking in France digital guidebooks are produced in PDF format to give you the best possible viewing experience and to allow easy access to the links within it. Each guidebook can be downloaded five times allowing it to be stored across multiple devices. As the author and a fellow traveller, I understand that you might share this book with other people, and your travelling companions in particular, in the same way that you share a physical book. By purchasing this book, you agree not to mass broadcast, email or upload this book to a peer-to-peer site.